Sharp high-pitched “twick,” sometimes given in a series. Description: Sexes similar. 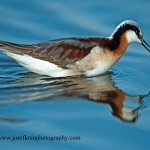 Breeding adults show mottled rusty head, mantle, and breast; feathers on the back are black with rusty edges; white belly. 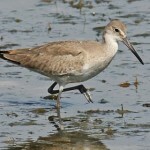 Winter plumage is the palest of all sandpipers: pale gray above and white below with black legs and bill. A bold white wing stripe shows in flight. 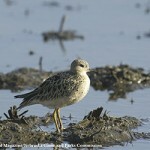 Habitat: Migrants found on sandy shorelines, sand flats, and salt-encrusted flats. Usually not associated with muddy shorelines. Where in Nebraska: Rare to occasional spring and fall migrant in eastern and central parts of the state. Rarer in the west. 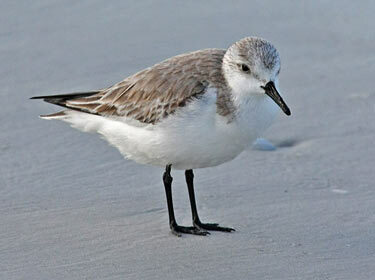 Field Notes: Sanderlings can be quite tame, as incubating birds can be observed from as close as two to three feet. Fun Facts: Sanderlings are often seen running the shoreline chasing receding waves and running from water when it returns. Males and females often incubate separate clutches and care for young separately.